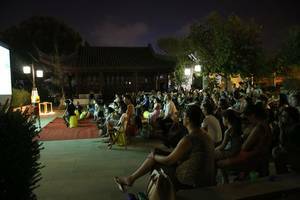 The Chinese Garden of Serenity in Santa Lucia proved an ideal place for the screening of writer-director Alê Abreu’s Boy and the World. 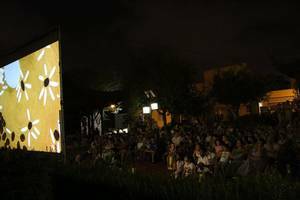 This was done using Solar Cinema, an entirely self-sufficient mobile cinema powered solely by electricity generated by photovoltaic panels which is then stored in batteries. Although only solar power was used, the sound and visual equipment used were top quality. The only two disadvantages were that the evening was quite hot and that there was no place to buy snacks and refreshments close by. Boy and the World is the brainchild of writer-director Alê Abreu, who even though being relatively unknown, managed to gain an Academy Award (Oscar) nomination for Best Animated Feature Film of the year 2016. Boy and the World‘s plot changes relatively with the person who is watching it. This allegory follows the adventures of a young boy who escapes the countryside to find his father in the city. The animated scenes, which are mostly either painted or drawn, change colours according to the characters and symbolism present, while the music changes tone and pace, with each main character having a different take on the same chord of notes. As young children see a simple life of a small boy with joyful, colourful friends and big, scary wrongdoers, adults see an allegory for life, which at some parts of the film makes you think about the monotony and different aspects of life. To adults, the plot hits some very sensitive matters, such as social inequality, injustice, destruction of nature and rural vs. city life. 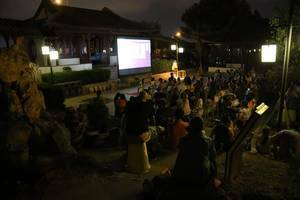 To sum up, the film offered an enjoyable evening for all the family while the surrounding environment offered a quiet, peaceful space to relax, with children lost in a world of colours whilst their parents lost in a sea of questions.